The winner of the 2018 London Marathon—both women’s and men’s races—was the forward lean. Both Eliud Kipchoge and Vivian Cheruiyot have flawless forward leans when they run, and since I had the good fortune to be on the racecourse with my camera, I’ve got high-speed slow motion video to show you how that works and what their competitors were doing by comparison. Here’s a compilation of my video of the women’s race, including Mary Keitany, Tirunesh Dibaba, Vivian Cheruiyot, Brigid Kosgei, and Tadelech Bekele. In it I point out the similarities and differences between the women. As you saw, Cheruiyot’s lean was significantly better than most of her competitors. Deeper than most, cleaner than all. A good lean is an asset because the forward and upward force from the foot in late stance more effectively moves the runner forward when the runner’s head lies on that line of force. This lean, combined with the higher center of gravity, better instability, and better mobility that result from high hands, gave Cheruiyot a pronounced running technique advantage over her competitors. Although all three men have very similar technique, the small differences I pointed out in the video make meaningful differences in their level of effort. A key difference visible from the side is, as I pointed out, the distance between hands and chest, as this determines how much a runner leans and has a large impact on footstrike, support in midstance, and how force is generated and directed. 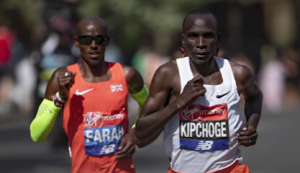 Here’s a front view that shows how close Farah’s and Kipchoge’s hands come to their midlines—an equally powerful factor. Unfortunately I was unable to get a similar image for Kitata, but if you watch a broadcast replay you’ll see they’re even wider than Farah’s. Hands will naturally swing to the midline unless a runner does something to prevent it, and anything preventing this will also change the shape of the torso, either creating flexion (Kitata) or extension (Farah) and in either case taking the head off the line of force from the foot in late stance. This makes running more difficult. However runners also have habitual ways of organizing themselves to balance and move the pelvis and trunk that may create tension, preventing the arms from swinging the easiest way. In either case, movement education—much more than simply coaching cues—is the way to help a runner feel how to use their arms in a way that facilitates really good running technique. Before the marathon, Eliud Kipchoge promised a “beautiful race.” He delivered, as he always does. The incredible poise and beauty of his running shine out from the naturalness of his form—no extraneous tension, no distortions. Cheruiyot’s joyful, determined running is cut from the same cloth. Taken together, these two runners point the way for the rest of us. P.S. Feeling at all puzzled, perplexed or outraged by something I’ve said? Find out where I’m coming from and on what basis I’m doing my analyses. I just read through this and then went right to your website and completed you free core action lesson. Then went for a run yesterday. Are you kidding me. Where has this been for the last 10 years! You mean my body is a complete system and I can use my core, legs and arms together to make running intuitive and easier. Man, this made a huge difference! I’m hooked and ready to jump into your online camp! I’m done with being injured all the time. After just one short lesson (experience), I can see this is going to bring power and passion back to my training….. thank you Jae!